Palmar Logística SL's team keeps growing. Recently, the new commercial Director, Jesús Martínez, has joined our ranks. Several factors have influenced your decision to join our company. His passion for animals, his affection for ornithology and his great career as a breeder make Jesus a very valuable addition to this company. As each one of the members of this company, it is animal lover, besides being breeder and fond of ornithology. "My favorite animal, no doubt parrots, I love all types of parrots and psitacidas, is more I have as pets two Ara Nobilis (dwarf macaws), some parrots that I love"
"My only intention is to do my job perfectly and give an unbeatable customer service, that's my purpose at Palmar Logística SL." From Palmar Logística SL we seek to give the customer an unbeatable price and service, personalized attention and a close and cordial treatment. With the new incorporation of Jesus, the sights of this company are widened wanting to satisfaccer an increasingly demanding customer. The mission, that our clients are satisfied with the treatment received. 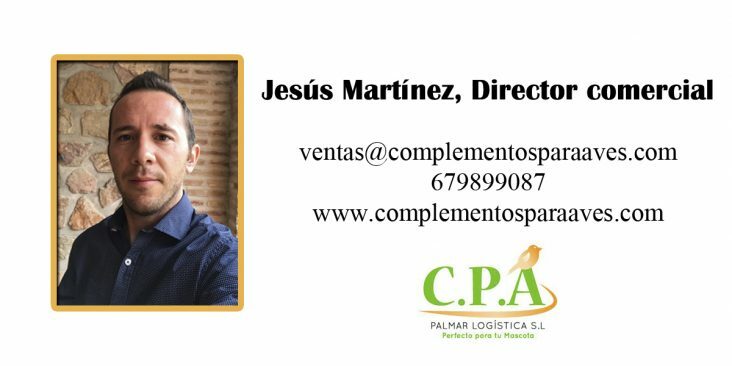 To contact Jesus and know what are the best offers that suit each breeder can be done through email ventas@complementosparaaves.com or phone 679899087.